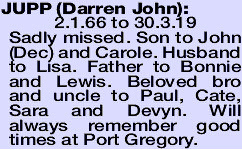 JUPP DARREN JOHN 2.1.66 to 30.3.19 Sadly missed. Son to John (Dec) and Carole. Husband to Lisa. Father to Bonnie and Lewis. Beloved bro and uncle to Paul, Cate, Sara and Devyn. Will always remember good times at Port Gregory.